First Game - Saturday July 20, time to be confirmed. Thread for discussion of construction/design process. 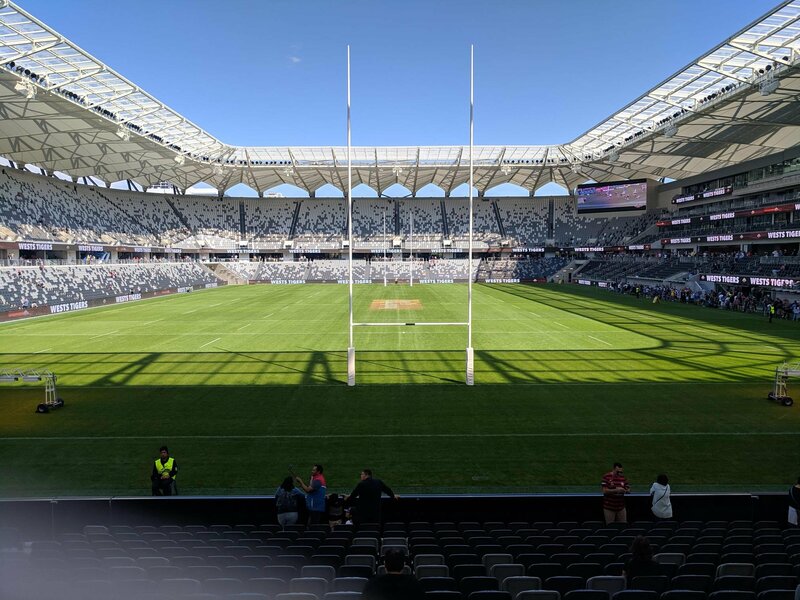 3.A very good view of the field....at ANZ and Spotless could not see the sideline closet to us.....We will be able to get a better perspective of the play and passing movements. 6. The roof should keep out all but the most vicious of Sydney Summer storms. 7. I give it an 8/10. 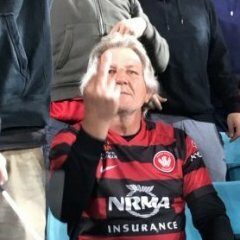 So what was the ratio of Wanderers jerseys to Eels jerseys? I reckon 2:1 in the 2-3pm time slot? I saw a lone Roosters' jersey and thought he must have been lost. Good line at the WSW tent and our staff looked professional. Same can't be said for the Eels. And then NSW Rugby, Tigers, and Canterbury just filled the space with no one talking to them. A good interview with a Leeds fan about the upcoming game. It should be a fantastic night and just imagine Aaron Mooy turning up for Leeds if they win promotion to the Premier League. I was also there at the 2pm session. Not a bad seat anywhere. Even on the back row you are still just over 30m away from the ground. Only drawback was by 3pm all seats were in the sun. Cannot wait to once again watch games at a football ground. Very impressive. Great view from my seats (Row 15 Upper Tier) though a little concerned about nose bleeds.. Somewhat disappointed after the build up, since we were only able to walk around the concourse and seating areas and look at a large empty space called the change rooms. Thought we might have gained at least a glimpse of how the other half lives. Kids thought the hot dogs passed the taste test with prices much cheaper than ANZ. Big winner on the day was Parramatta Leagues with membership applications. Roll on July 20 and Season 2019/20. I was there from about 1pm to 2:30pmish, there were all sorts of club shirts. Saw the obvious Wanderers and Eels fans (seemed about 50/50 to me), there were a decent amount of Wests Tigers, the usual kids wearing Ronaldo/Messi shirts, some Cronulla Sharks, a few Rugby shirts and a handful of other assorted NRL shirts (Newcastle, Warriors, Bulldogs, Aboriginal stars etc). I saw one woman in a Friends Of Parra Pool shirt with "Where's the Pool?" on the front. I hope she recognised the sacrifice that had to be made to ensure our stadium was built. Any concerns about how close people are to the pitch are simply are put to bed. Hopefully there's no stupid advertising hoardings between the goal and the fence. The seats in the bottom tier are amazing. The prawn sandwich areas looked a little bit less opulent than I expected, although it might have been because they were setup in the function room plan. It's obviously far better than the old Parramatta Stadium corporate areas. There are a few locations that need touching up, occasional gaps in the cement work, paint not done. There's also a few walkways in the stadium that have unexpected dips or rises. The bare concrete doesn't look flash I'd want to see it painted over at some point. I also wouldn't mind more bunnings tarp to cover the exposed steel & concrete on the outside & underneath inside the concourse, although I'm not sure I'd want potentially flammable material on the roof of the only escape routes. It has a very brutalist feel if you start looking up at the skeleton of the stadium. I feel sorry for anyone in the last row of the top tier that isn't in good shape. Going from bottom to top of the lower bowl was bad enough, people will be getting sherpas and setting up basecamps for the trek to the top tier. The walkways felt a bit narrow but if someone like me could still get in easily there enough it shouldn't be a problem. The prayer room has powerpoints so if anyone ever needs to charge a phone in there, you've got a place to plug in. That entrance walk from the main gate through to the balcony overlooking the pitch and viewing angle to the main grandstand is an amazing first impression. Alcohol is unsurprisingly stupidly expensive at least in my view. $6.50 for a 375m drink is the cheapest, $7.90 for a 330ml cider is insane and $10 for pre-mixes is just gouging. Soft drinks at the food stalls are $4.90 for a 600ml, which isn't that bad for a stadium, water is $4.30. Food is standard stadium fare. Hot dog, small chips or a pie for $4.90, large chips $6.50, snacks (popcorn, chips) $4.50. I missed getting a picture of the other food stalls near the RBB but it appeared to be a decent cost for things like Burgers or Wraps. With the new parking costs at the leagues club if you're a member you could spend $8 iirc in the club to get free parking to save $25 (which is the event day parking cost), easiest option is go to the Sports Bar on Level 2 and get a Banana Bread/Muffin and a Iced Coffee or other similar priced drink. I really really really hope there's a proper pre-paid parking ticket like at ANZ because I really don't want to deal with having to find parking elsewhere even for free. 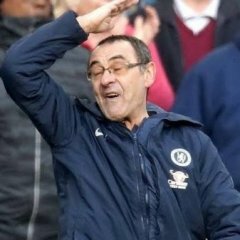 Maybe I should ask the club for a media pass and get parking at the stadium. 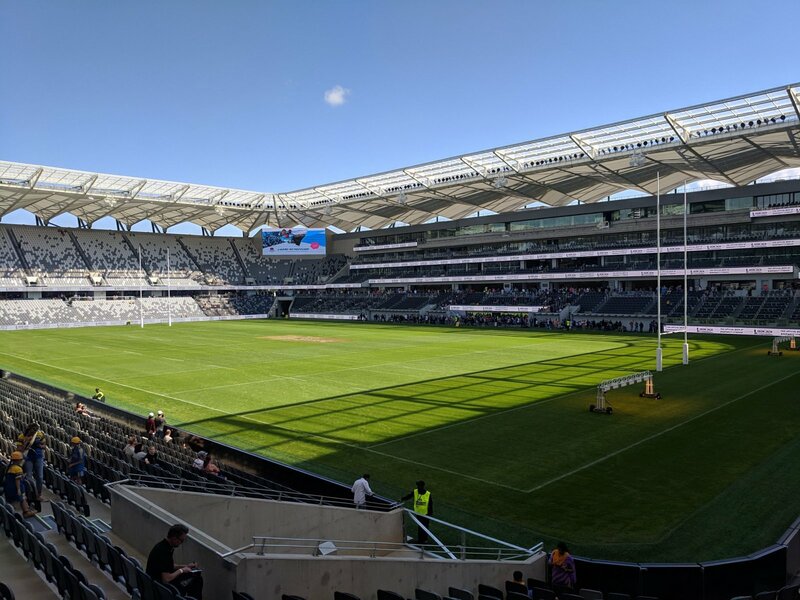 This is the best stadium in the country in any code, the only places that even have an argument are the likes of the new Perth stadium and the SCG/MCG based on history etc (and even then it'll only be big matches like Cricket Test matches). If you exclude those big ovals, my rankings are #1 Parra, #2 AAMI Park, #3 Suncorp (for big matches), #4 Gold Coast Rectangle and then all the others. I can't see the new SFS being anywhere near as good as ours based on the fact it's going to be at least 50% empty most of the time and they are building a very similar shell to the original. If the Government decides to rebuild ANZ they need to let Populous design it. I should have got some pictures of the forecourt area. I felt like it could use more seating for people to wait before gates open. They could also fit a futsal court in there and hopefully replace the basketball court with one. Anywhere that wasn't in direct sunlight was very comfortable because of the wind & breeze circulating through. 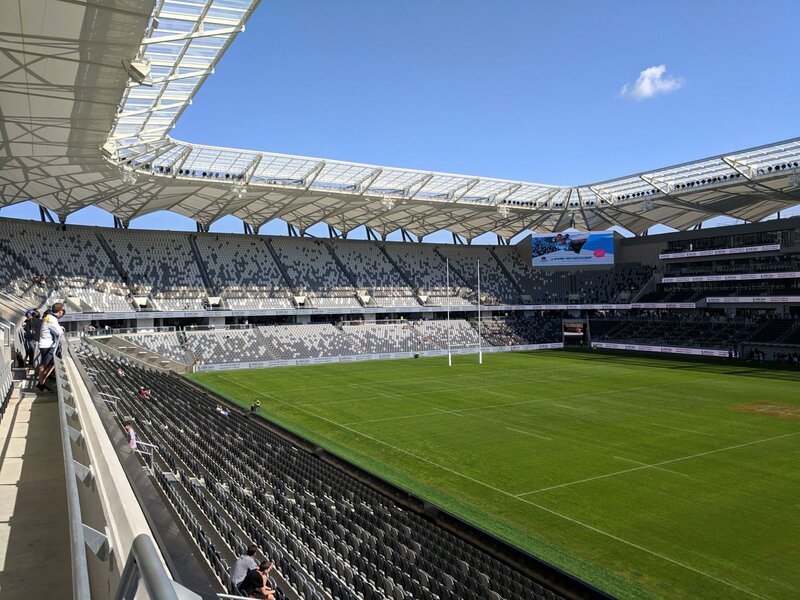 If you're light or heat sensitive and worried about 3pm matches you will want a seat anywhere but the non-main grandstand or the bottom bowl of the away end opposite the RBB. 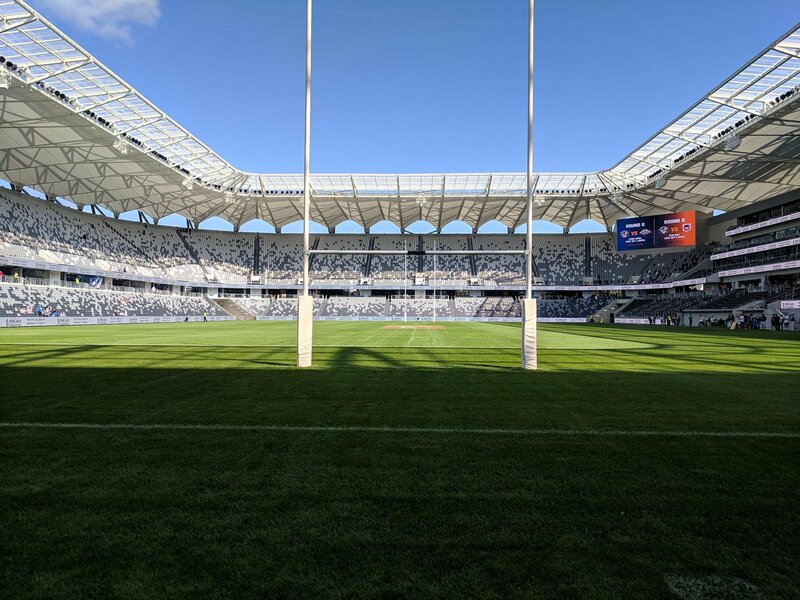 Anywhere in the main grandstand, RBB end or the two corners connected to the RBB or the Main Grandstand will be okay. Last thing: Wasn't this meant to cost $300 million? It's very recently become $360 million. Went to the 12.30 session. About 2:1 Eels to WSW shirts with a sprinkling of Tigers. 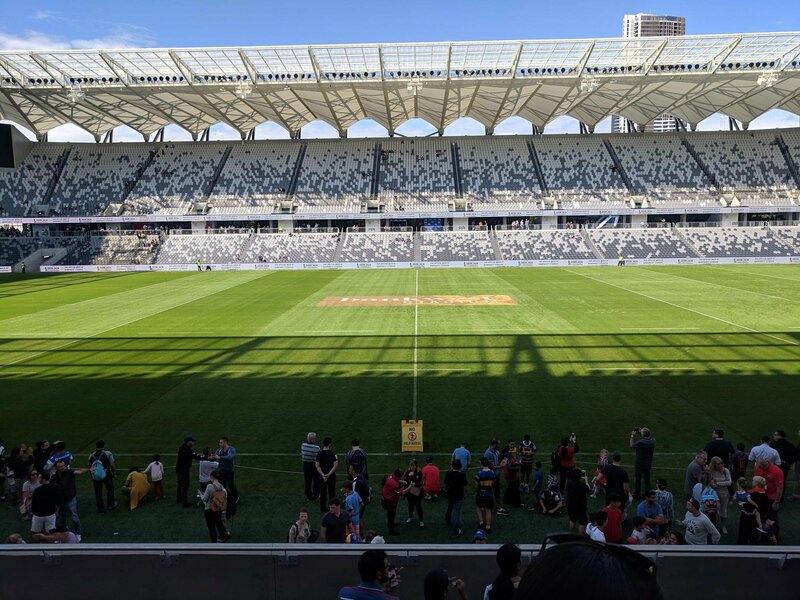 Its definitely the football stadium we have been waiting for in Sydney matches, if not betters, AAMI Park in Melbourne which, up until now, was hands down the best one in Australia. Was at the 12:30 session and loved the stadium, width of the concourse, the number of food outlets (with plenty of staff selling very little today for the surprisingly small total crowd of 20,000 over the 4 sessions) and number of toilets. Stands certainly are steep and seating close - atmosphere at WSW v Leeds will be amazing. Paded seats in the corporate area are very nice. Great to have a chance to catch up with the wonderful Wendybr - sorry can't reply to your text message but I am truely old school and have the most basic of phones. Just hope our team can do justice to this fantastic facility! It was lovely chatting to you and your wife! Hopefully we can catch up again...and that you can get your wife along to a Wanderers' game at our new stadium! PS I loved the stadium...and I can't believe that we won't be able to generate something of the atmosphere we had a few years back there! Was at the 2pm session. Looks amazing. I didnt get to check out the food options. I may only partake in stadium food if i cant make it to one of the fab establishments in Parra. The only thing I’d add is the parents room on the northern end wasn’t finished. The one in the southern end was finished, was a smaller version of the one you’d find in the shopping centers. Still very good. Those large empty areas were the warm up areas. The changing rooms weren’t finished apparently. Those that needed lift access to the lower floor got glimpse to the internal tunnel running along the inside of the stadium along the ground floor which comes out in the south west corner. I went to the 12pm session, it looks very impressive outside, inside even better. Concourse reminds me of Central Coast stadium, very open. Walking into the stadium, its hard to believe this is our hard ground. There's a great view wherever you sit in the ground. The upper tiers is very close and very steep, much steeper than Lang Park. Facilities wise, firstly, the toilets, even though its new, its going to smell like piss in there with the smell of piss going to linger in the toilets, doesn't seem much 'ventilation' or fan to help get rid of the smell. Food i'd say are priced reasonably ok for stadium food, I only had the hotdog and I give it a thumbs up, quality is there. I was at the 2pm session. The one notable thing that doesn't look like changing is the P.A system and the annoying people on them. Just as loud and innane as the old Parramatta stadium , ANZ and Spotless. Also a Pet hate of mine. Some years ago one could go to a game, arrive 15 minutes or so before kick off and have a good conversation with those seated nearby. Can't do that anymore. I now time my arrival at my seat right on kick-off to avoid having the PA yelling mindless crap which continues all thru half time. I don't know why we put up with this ****....I bet you don't hear it in the corporate box's. I complain about this in every feedback survey. Good on ya, I have done so also, however they're not listening (pardon the pun) Maybe we should collectively unfurl a 4 word banner " Shut the **** up"
They did modify what they were doing a few seasons ago...when we voiced complaints. Can't remember the details...but I think we had a comments /feedback thread that someone from the club checked out? And that was a request made. 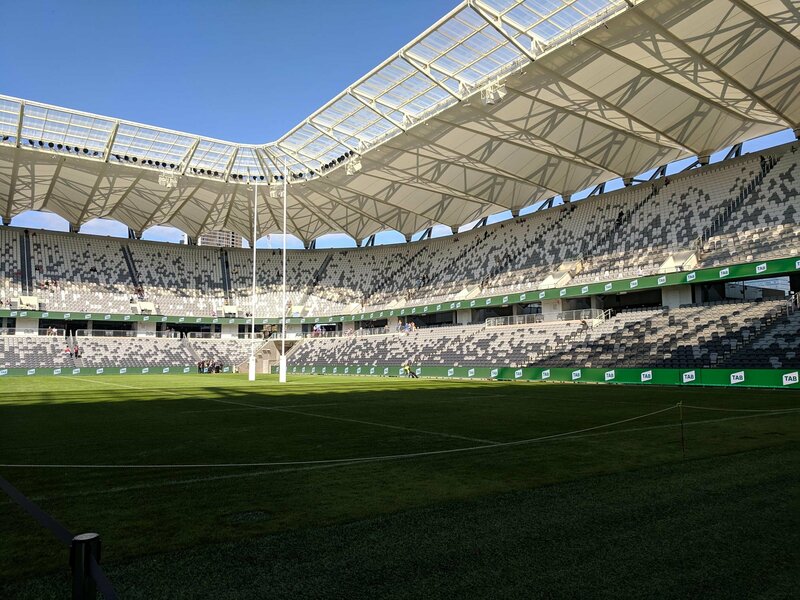 It's one major backwards step from Parramatta and the SFS, where their PA systems were from the 80's and half the ground didn't have working speakers anyway. Just on this PA System annoyance, I heard or read some time ago that some Clubs (possibly in Bundesliga) shut down their PA's 15 minutes before kick of. FC St Pauli might, maybe FCB would know. When we were going through the “walkout song saga” I remember the club shut off the PA but didn’t work for some reason or another. Was looking at the seats, can someone tell me how it’s going to work? Are the seats going to be removed & the rails put in its place? I noticed in the bays designated for safe standing had the supports bolted into the ground as opposed to the back wall which is for the rest of the stadium. If that was the case, they should have done it for the entire north end. It was really annoying with them playing the music very loud over the RBB last night and that stadium announcer is just as annoying. Impressive. Sat in a seat looking at the pitch i felt like it was a newish Championship ground in England and that is amazing for here. I agree with Mack on it being a bit concreate and plastic, but in time we will put our stamp on it and make it home. I also went to the 12.30 session, although they were happy to let us in at 12.15. Good start. I arrived at 12.00 pm with young Wanderboy and one of his mates. Because we were half an hour early, we did a full walk around the outside of the stadium and then returned to the front entrance at Gate B. It looks great from every angle for me. I understand that this was built as a low budget stadium. The two lads commented that it looked a bit average from the outside, which I understand. They both follow football from all around the world and have seen some of those classic stadiums that have been built recently. Mostly on PS FIFA. I explained to them that this was an IKEA stadium built on a restricted budget therefore cost cutting had to be made. Also told them that thankfully, the place hasn't been put together with alan keys. Firstly, I thought the day was perfectly organized. I didn't know what to expect, and was somewhat expecting ropes and pathways and cattle herding security and quite limited access to many areas (due to OH&S shite these days). I was pleasantly surprised and excited when we arrived to find out that it was pretty much open house. On the drive to the stadium, the lads and I were thinking, "yeh, we'll have a look, probably be there half an hour at most. Will be good to see etc....."
Well, we spent 2 hours there! Couldn't leave the place. The lads were awestruck, as was I. 1. Concourse areas are far more spacious than I thought they would be when I was following the construction. So much room, although with 30000 people there, maybe it will be different. 2. Once we had entered, we resisted the temptation to walk straight up to the first opening to see inside, and instead we did a full lap of the stadium, checking out the food and beverage stations, prices and options. 3. As we progressed, I was very impressed with those options. Again though, with a full house, it could get very busy. Toilet facilities seem plentiful, and there are a decent amount of bars for us piss heads. The range and variety is a far cry from the old overpriced "pies and chips" shite we are used to. I went into every food outlet and checked out what they had on offer. The food looked pretty decent. Specialty burger places, seafood outlets, chicken outlets and then the standard fare as well. There were also Thai noodle dishes, sushi, fried Asian condiments and decent healthy sandwich and salad options. A really decent variety of alcohol, ranging from fairly cheap to normal stadium prices. So be it. (Further comment on the food later). 4. It's good to see a few sit down bars on our pleb concourse. I didn't expect that. The few there are could get really crowded though. 5. The dugouts/Managers areas are sensational. Finally a stadium that CATERS FOR FOOTBALL!! 6. Geez, I reckon that Field Club area where the players walk through to enter the field is a recipe for disaster. Imagine walking out in front of a massive bar full of pissed dickheads! Good for the home team before the game. Alternatively, returning in after a loss with the area full of facebook heroes? I reckon there might well be changes to this area in the future. Time will tell how us Aussies deal with such an innovation. Not so bad for watching the players warm ups though, although hardly any of us will get that privilege. 7. I quite liked the BBQ areas. Quite large, and good for a meet up before matches perhaps. 8. We then checked out our seats for the Leeds match. Behind the RBB. Suitably impressed. 9. That outside curved video screen will be largely useless at day games. Whoever thought of that idea should be shot. He/she might be saved the death penalty though because it'll be ok for night games. In full daylight, it's almost unseen. 10. Finally, having done the full circle of the stadium, young WB and I walked up to check our season ticket seats out. We had done the full circle of the stadium. Our seats are in the north east corner, right above that main entrance today. Back row. Geez, I reckon in about 5 years I'm going to regret getting these!! I really was surprised at how steep it is. I was secondly surprised how high it was in the back row. Thirdly, I was so impressed that even in the back row, we still felt so close to the pitch. But **** me, I doubt I can ever get 4 beers up there without spilling most of them. Thank f*** there are handrails for the walk down. That top tier is seriously steep. Love it!! And the rest of the stadium from up there looks absolutely unbelievable. (except that snobby corporate side). Video screens are excellent viewing. Anyway, after all that, we decided to leave, but on the way out, with two teenage boys, I asked them if they were hungry and wanted something to eat. So, we then tried out some of the food. We went to the burger joint. I ordered the Angus burger, $12.90. It was actually very good and I don't mind paying a bit extra for a burger in a stadium. The impressive thing was that it was fresh. Tomato, onion, beef patty, sauce etc.. were excellent. The bun was amazingly fresh for a stadium burger. I will always be eating in eat street before future games, but it's great to know that stadium food has gone up a notch or three. We took the food that we had bought back up into the top deck, grabbed some seats above the shade level at the time and spent another half an hour there, eating and taking in the view. All in all, it was a great day. I soaked it all up as an old fella. The two lads also weren't in any hurry to leave. They took so many pics and videos! We ended up spending 2 hours there. I was proud of that because when the original Pirtek was built, I was their age (roughly) and I was equally excited watching it getting built in the 80's. This stadium may well be a ground breaker in this country. It's very much a football stadium as we know it. Atmosphere will be superb. One last thing. There have been many claims that EVERY seat in the stadium has a perfect view. I generally think that's correct, although I actually found about a dozen or so seats today that have the worst views ever. In Mack's first pic in his opening post, there are a few seats above that tunnel opening in the south west corner. They have massively restricted views. I'm disappointed that I didn't take a few pics and post them here. There is quite a few seats there that don't even have a view of half the pitch. Glad I didn't pick them as season tickets!! Anyway, sorry for the long post, but I'm a massive stadium nerd, and today was my nirvana. I gather that after the morning rush there wasn't enough people inside to need to stop people getting in early. I posted about the field club in the construction thread, but anyone who is in there is going to be a premium corporate type. It doesn't exist for drunk plebs like the rest of the stadium. Anyone who causes a scene in there is going to be in a lot of trouble from the stadium & police and if they are there as a corporate that could be a job killer. The new Perth Stadium has the same thing I don't think there's been any issues there. That LED screen when I rocked up I thought they'd taken it down for some reason and only when I got up close I realised that it was on, it's just completely ineffective in the sun. 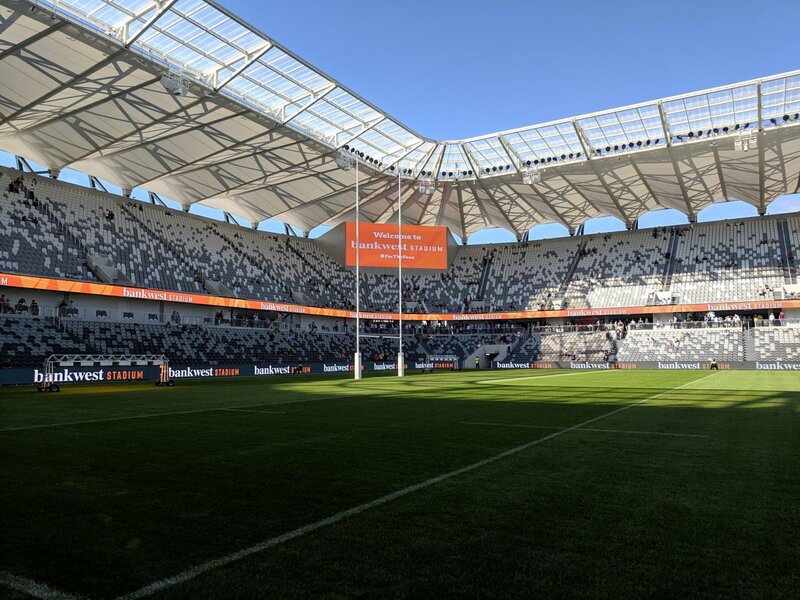 I opened it up in photoshop and if you adjust the brightness and contrast you can barely make out that it said "bankwest stadium". Evening games it won't be a problem for, maybe not for certain 3pm games either. The tunnel to the right of the RBB has a single row of seats and there wasn't any restricted view there. I suspect that the 'no bad seats' moniker is going to be more like 'no bad seats sold'. Or maybe they expect people to stand in them. I know the seats right in front of the tunnel to the left of the RBB might be a bit dodgy, but the single row of seats (very odd) to the right hand side of the RBB were fine are are actually pretty damn good seats for a corner (they might have a very small restriction of the right corner on the other side).